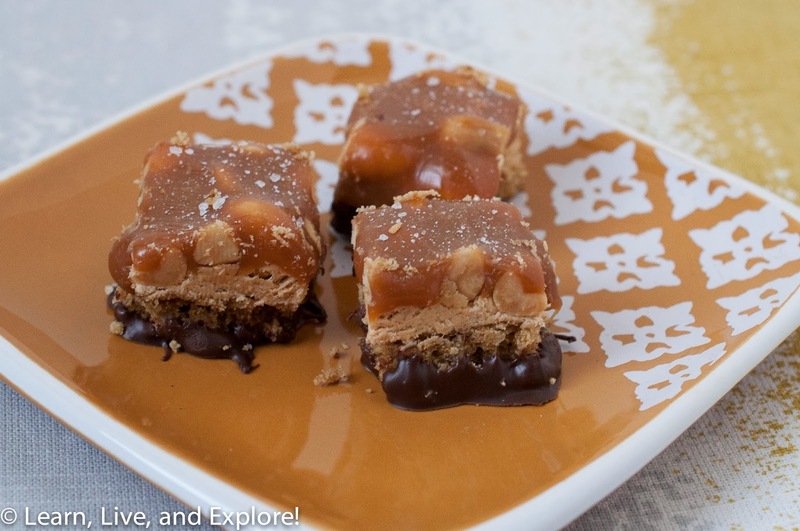 Salted Caramel Peanut Nougat Chews ~ Learn, Live, and Explore! Do you like Reese's or Payday candy? Do you like that uncontrollable "mmm" after you take a bite of something ridiculously delicious? This is so bad, but I could not stop munching on these treats, and I'm high-fiving myself because I was genius enough to cut them into bite sized pieces lest my stomach expand even more than it already has! 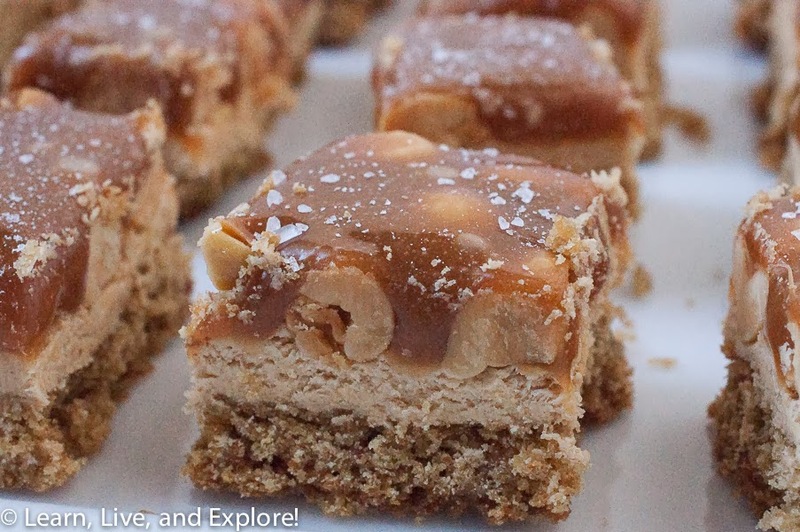 Thank you so much to Cookies and Cups for posting this recipe!! It has actually inspired me to use the peanut butter fluff in another recipe...stay tuned. Line a 9x13 pan with foil and spray lightly with cooking spray. In mixing bowl cream butter and brown sugar together until combined. Add in egg yolks and vanilla and continue beating until incorporated. Scraping sides as needed. Add in baking soda, flour and pretzels and combine on low speed then gradually increase the speed to medium-high. While the crust is baking, combine marshmallow creme and peanut butter in a microwave safe bowl and heat on full power for 45 seconds, stirring to combine. If needed continue heating in 15 second increments until smooth. Stir in powdered sugar. Easily lift foil out of pan and cut. Optional: Melt semi-sweet chocolate chips slowly in the microwave and dip the bottom of the squares in the chocolate. Place on wax paper to cool/dry.